“It belongs in a museum.” is a famous line said by Indian Jones in Indiana Jones and the Last Crusade. This is Marabou’s favorite Indiana Jones movie and they’ve seen it hundreds of times. Marabou has loved Indiana Jones for a very long time. The movies inspired Marabou’s love for history, objects/artifacts, and museums. The phrase, “It belongs in a museum.” now makes Marabou think about the role of museums as keepers of culture. Who decides what objects belong in museums and which don’t? How are the objects acquired? When is it time for an object to leave its culture and enter a museum? These questions relate to an earlier post, “Object Labels at the Museum” in which Marabou explored provenance and museum labels revealing, or at least implying, how museum objects are acquired. Indiana Jones movies now resonate differently with Marabou, even beyond the blatant cultural stereotypes of foreigners and gendered stereotypes of women all shaped through the white male gaze. The idea of Indiana, a cisgender, straight, white man exploring, interpreting, and obtaining objects from around the world to save them from the wrong hands (granted, sometimes it’s saving objects from the Nazis which is a good thing) doesn’t seem as romantic or exciting as it once was for Marabou. The movies talk about the adventure behind “rescuing” these objects, but not about what happens once the objects are in a museum. 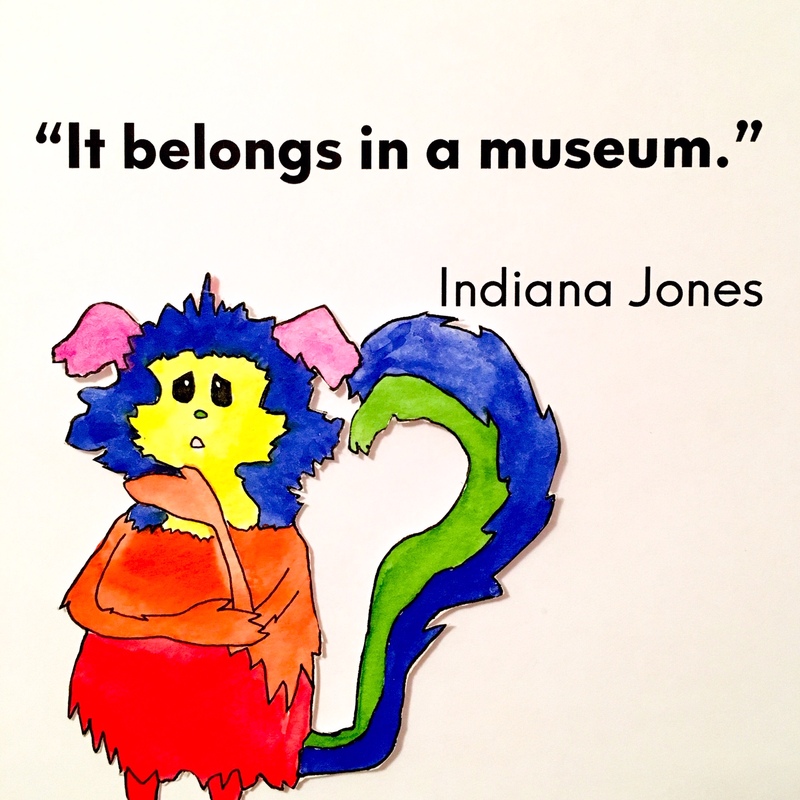 As the credits roll and, as the film suggests, Indiana takes the objects to a museum, Marabou wonders if Indiana would interpret the objects correctly, fairly? Would he explain the history of how they were acquired? Would he seek the input of people who represent the object’s culture in its curation? Or, would his interpretation be something Marabou critiques today? Two of the objects Indiana “saves” in the movies, the Ark of the Covenant and the Holy Grail, are religious objects associated with Jewish and Christian traditions. Putting them in a museum saves them from nefarious uses (such as the Holy Grail granting eternal life to Nazi soldiers), but in which museum do they belong? Who has the right of ownership? In short, Marabou acknowledges that their relationship with the beloved Indiana Jones is now complicated. It’s hard to see something adored in one’s youth not living up to one’s values as an adult. Marabou’s main worry is not about what would have happened to the objects featured in the films, since, after all, the films are fiction. Marabou is concerned that the Indiana Jones movies and the character of Indiana Jones perpetuate the idea that a white male savior is the authority on world cultures. What objects should be in museums? Who should decide? When is it better to have an object preserved in a museum instead of remaining with its culture of origin?